The Huyck Preserve offers public access to Lake Myosotis for fishing, kayaking, canoeing, and picnicking. Lake Myosotis is also a perfect location for bird watching. Great Blue Herons and Bald Eagles can frequently be seen swooping across the lake and many warblers inhabit the brush just off Lake Trail East. Be sure to keep an eye out for the resident beavers as well! Limited parking is available at the Huyck Preserve for those visitors wishing to enjoy our Lake Program or Hiking Trails. Visitor parking is available at the Visitors Center, Eldridge Research Center, and Lake Myosotis Boat Docks. Please contact the Visitors Center (518-797-3440) with any questions about parking, the lake program, or our trail system. Beach Passes are REQUIRED for swimming in Lake Myosotis. Beach passes are available at an additional fee of $90 to Huyck Preserve Members only. This fee pays for the insurance and lifeguards necessary to maintain the beach program. Lake Myosotis is a reservoir that provides drinking water to the Village of Rensselaerville and surrounding areas, and the Preserve is responsible for maintaining water quality. For this reason, passes are offered to members in a tiered systems. Passes open first to members in the Town of Rensselaerville, then to members living in local school districts nearest the Preserve (Greenville, Berne-Knox-Westerlo, and Middleburgh). If passes are still available, after the beach opens for the season (typically in mid to late June), passes will be offered to all members regardless of geographic location. The Preserve regrets that the beach is a limited membership benefit and cannot be open to everyone, but invites all members and visitors to continue to take advantage of the Preserve's extensive trail system, boating and fishing on Lake Myosotis and the Preserve's many educational programs. Participation in swimming lessons is open to all families whether or not a member and regardless of residence. Swimming lessons are available the month of July in two concurrent sessions meeting Monday, Wednesday, and Friday 10:30am-12:00pm. Session I will run from July 9-20, Session II will run from July 23- August 3. Though this course is more suited to the beginner-level swimmer, swimmers will be grouped into three abilities (3-5, beg/intermediate, and intermediate). Find the 2018 registration form here. For more information or questions about this program, please contact aquatics@huyckpreserve.org. 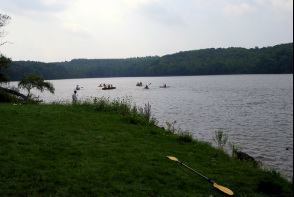 Kayaking, canoeing, and non-motorized boats are permitted on Lake Myosotis only. Limited boat racks are available to members of the Huyck Preserve. Racks will be assigned on a first come first served basis, for an additional fee ($50). The Preserve does not rent boats. Boats and kayaks are not stored and must be removed prior to the first snowfall. Please email membership@huyckpreserve.org for more information about the boat rack program or to purchase a spot. 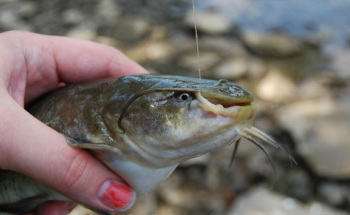 Fishing is allowed on Lake Myosotis ONLY and with a current NYS fishing license. Ice fishing on Lake Myosotis is also allowed if conditions permit (hand augers only). Fishing is NOT permitted on Lincoln Pond. Pricing current as of June 2018.